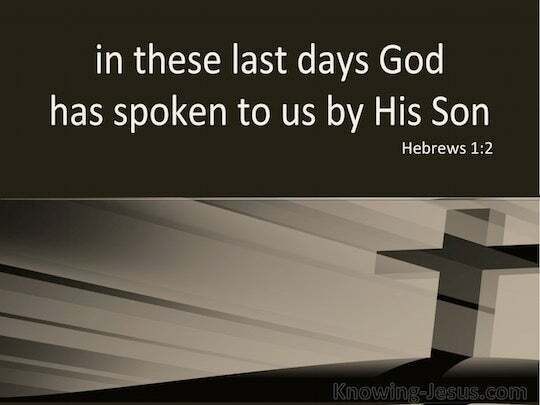 ﻿ Hebrews 1:2 has in these last days spoken to us by a Son whom he appointed to be the heir of everything and through whom he also made the universe. 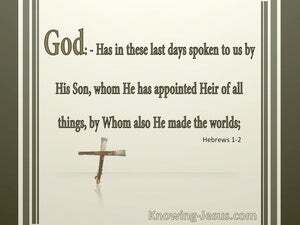 whom he appointed heir of all things, through whom also he made the ages. [but] during these final days He has spoken to us through His Son [Note: This period refers to the Christian age (See Acts 2:14-36)], whom He appointed to be heir of all things [and] through whom He created the universe. [See John 1:3; Col. 1:16]. but in these last days he has spoken to us by his Son, whom he appointed heir of all things, and through whom also he made the world. whom he hath constituted heir of all things, by whom also be made the world. but in these last days he hath spoken unto us by his son, whom he hath made heir of all things: by whom also he made the world. 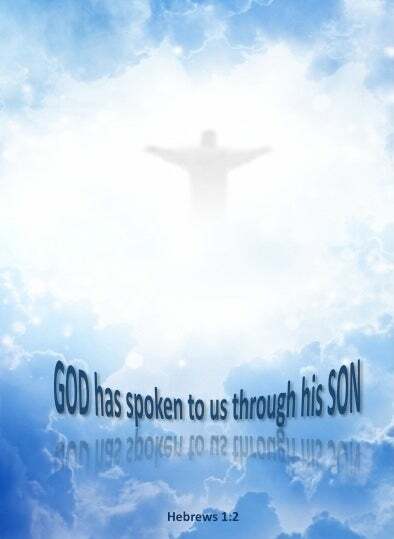 but in these days at the end he has spoken to us by a Son ? ?a Son whom he appointed heir of the universe, as it was by him that he created the world. has at the end of these days spoken to us in a Son whom he appointed heir of all things; through whom also he made the universe. in these last days he has spoken to us in a son, whom he appointed heir of all things, and through whom he created the world. 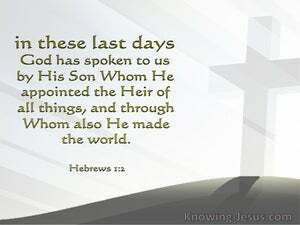 in these last days has spoken to us by his Son, whom he appointed heir of all things, through whom also he made the worlds. has in these latter days spoken to us by the Son, whom he appointed the heir of all things, and through whom he made the universe. has at the end of these days spoken to us through a Son, who is the pre-destined Lord of the universe, and through whom He made the Ages. but in these latter days He has spoken to us through a Son, whom He had appointed lawful owner of everything, and through whom He had made the worlds. 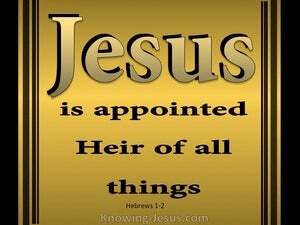 whom He hath appointed heir of all things, by whom also He made the worlds. "In the last days, God says, I will pour out my Spirit on everyone. Your sons and your daughters will prophesy, your young men will see visions, and your old men will dream dreams. But Jesus was silent. Then the high priest told him, "I command you by the living God to tell us if you are the Messiah, the Son of God!" "For this is how God loved the world: He gave his unique Son so that everyone who believes in him would not be lost but have eternal life. Now if we are children, we are heirs heirs of God and co-heirs with the Messiah if, in fact, we share in his sufferings in order that we may also share in his glory. and put everything under his feet." After this, Jacob called his sons together and told them, "Assemble yourselves around me so I can tell you all what is going to happen to you in the last days. Meanwhile, since I have to return to my people, come and listen while I tell you what this people will be doing to your people in the last days." In your distress, when all these things happen to you in days to come and you return to the LORD your God, then you will hear his voice. because I know that after my death, you'll surely act wickedly and turn from the road that I've instructed you. As a result, evil will fall on you in days to come, because you'll act wickedly in the sight of the LORD, causing him to become angry due to your behavior." "I have set my king on Zion, my holy mountain." "It will come about in the last days that the mountain that is the LORD's Temple will be established as the highest of mountains, and will be raised above the hills; all the nations will stream to it. I myself made the earth and personally created humankind upon it. My own hands stretched out the skies; I marshaled all their starry hosts." "Yet the LORD was willing to crush him, and he made him suffer. Although you make his soul an offering for sin, he will see his offspring, and he will prolong his days, and the will of the LORD will triumph in his hand. The fierce anger of the LORD won't turn back until he has accomplished and established the plan of his heart. In the days to come, you will understand this. But I'll restore the fortunes of Moab in the latter days," declares the LORD. This concludes the judgment on Moab. You'll come up to invade my people Israel like a storm cloud to cover the land. In the last days, Gog, I'll bring you up to invade my land so that the world will learn to know me when I show them how holy I am before their very eyes."'" "None of the advisors, enchanters, diviners, or astrologers can explain the secret that the king has requested to be made known. But there is a God in heaven who reveals secrets, and he is making known to King Nebuchadnezzar what will happen in the latter days. Afterward, the people of Israel will return and seek the LORD their God and David their king. They will come in awe to the LORD and to his goodness in the last days. "But in the last days it will come about that the Temple Mount of the LORD will be firmly set as the leading mountain. It will be exalted above its surrounding hills, and people will stream toward it. Then a voice from heaven said, "This is my Son, whom I love. I am pleased with him!" This is the beginning of the gospel of Jesus the Messiah, the Son of God. I don't call you servants anymore, because a servant doesn't know what his master is doing. But I've called you friends, because I've made known to you everything that I've heard from my Father. For you have given him authority over all humanity so that he might give eternal life to all those you gave him. and was declared by the resurrection from the dead to be the powerful Son of God according to the spirit of holiness Jesus the Messiah, our Lord. Now lifted up by God to heaven, a name above all others given, this matchless name possessing. For to which of the angels did God ever say, "You are my Son. Today I have become your Father"? Or again, "I will be his Father, and he will be my Son"? But about the Son he says, "Your throne, O God, is forever and ever, and the scepter of your kingdom is a righteous scepter. Then he would have had to suffer repeatedly since the creation of the world. But now, at the end of the ages, he has appeared once for all to remove sin by his sacrifice. On the one hand, he was foreknown before the creation of the world, but on the other hand, he was revealed at the end of time for your sake. They kept telling you, "In the last times there will be mockers, following their own ungodly desires."